Abiding Limousines is a customer service focused luxury limo company providing wedding couples with the ride of their life. With a newly updated fleet, their vast array of vehicles will hold parties of any size. 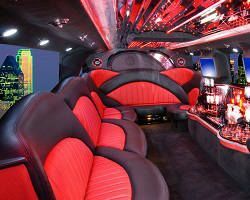 Being one of the highest rated limousine companies in Houston, Abiding Limousines is known for its professional manner, polite drivers, and on-time arrival. If you are looking for comfort and a worry free transportation experience, visit Abiding Limousines today. Standing by their 100% satisfaction guarantee, Advantage Limousine Services has been offering Houston bridal parties the ride of a lifetime for years. 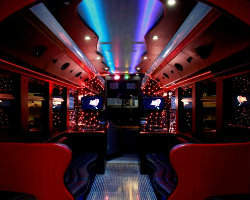 Hummers, stretch Lincolns, and luxury vehicles including a 28-30 passenger ultimate party bus are all available with a chauffeur for the night. With multiple vehicles to offer, your family and friends can all enjoy the ride. Top quality customer service paired with no hassle timely drivers is the standard for every event. Their exclusive line of limos are always in high demand, so give Advantage a call to reserve your limousine today. Houston Limo Service offers 24 hour car service, car rental and Houston limo service people need for airport transportation, prom limos, or for wedding groups. They are one of the limousine companies that are the most reliable in the state. Customers seeking Houston limo service love this company for its professionalism as well as its affordable prices. It can be hired for simple airport transportation, cruise transportation, large groups or small groups. Best of all, all of their drivers are qualified chauffeurs who know their way around and can assist clients with their needs. 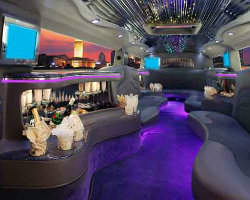 No wonder they are considered as one of the best limo companies in Texas. Houston Limo knows that they need to but their customers first. AFC Transportation provides wedding transportation across the state of Texas! We can provide transportation via bus, limo, van to your special day! Get a lift from AFC Transportation to the ceremony, reception or on your way to the airport for your honeymoon! AFC Transportation has a wide variety of vehicles, perfect for just the wedding couple, the entire family or rent multiple busses for a short destination wedding that your guest won't forget! Contact AFC Transportation today to reserve transportation for your big day! With one of the most diverse and updated fleet of vehicles in Houston, Destiny Limousine Service offers a variety of packages for wedding couples and their guests. If you want to arrive in style on your big day, your choices range from an antique classic 1939 Chrysler Imperial, a white stretch limousine, Hummer limousine l, Escalade limousine, or party bus that the whole gang will fit into. Serving the greater Houston area since 1991, Destiny Limousine provides exceptional customer service and is available for vehicle consultation and scheduled hourly bookings. Sam’s Limousine provides quality Houston limo service by offering fully loaded car service for airport transportation, prom limos, stretch limo, or cars for wedding groups at reasonable and affordable rates. 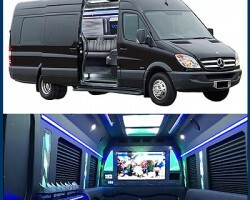 Some of their services includes car rental transportation for nights out at the casino, corporate meetings, sporting events as well as acting as a Houston airport taxi. Locals and out of town travelers alike prefer them for their efficient, safe and professional limo service. So, whether you want to celebrate a birthday or an anniversary, need to get out of town for a morning flight or just want to impress your friends by driving around town in a stretch limo, Sam’s is ready to be of service and provides the best of the best in Houston limo service. 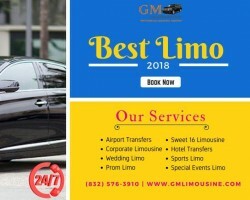 GM limousine Services is a reputable Limousine Taxi service provider in Houston . We specialize in providing professional Limousine Taxi service for airport transfers to / from Intercontinental Airport of Houston ( IAH ), William P . Hobby Airport , Ellington Airport , Sugar Land , West Houston Airport , and all the private airports around Houston metropolitan territory we also serve Galveston Cruise Terminal . 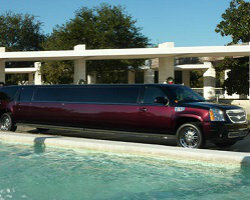 We also provide Limousine service in the Greater Houston for all special events , sports , and weddings . We have the industry best chauffeurs and well - maintained world class Limousine models . Royal Limo and Town Car provides door to door limo service, wedding transportation, car rentals, prom limos, and airport transportation. Customers seeking a car service or stretch limo can count on affordable rates when they need a ride whether their trip is personal or professional in nature. If you need luxury Houston limo service, then call on this provider for instant satisfaction and rates that can’t be beaten in the state of Texas. No matter if you need to get to your hotel in a town car or need a stretch limo to transport a crowd to a party, Royal Limo and Town Car provides the best limousine rental in the state.